How to install an Air Gap in your Dishwasher? Having an air gap connecting your dishwasher to the sink or garbage disposal is very important as it keeps your dishwasher clean and mess free. It also saves you the effort of manually cleaning your dishwasher after every use, which defeats the purpose of not having to clean your dishes, pots, and pans. The air gap in your dishwasher also avoids a clog in the kitchen drain sink that may cause dirty water to flow back into the dishwasher, which may contaminate the washer and what’s cleaning inside. Some states or municipalities also require having an air gap for this purpose. You can install an air gap on your own, without having to book a plumber to do it for you and pay him hundreds of bucks, depending on the rates of his services. How do you install an air gap for your dishwasher on your own? You will find a step-by-step installation guide in this article to help you through the process, especially if you don’t have any experience in building or DIY home projects. Step 1: There should be a pre-punched hole in your sink next to the faucet. It may be covered by a round cap that you can pry open on top or from the bottom. This hole located at the faucet base will be used for the air gap. If your sink doesn’t have it, you need to create a hole by drilling. Measurements should be 1-3/8” (3.5 cm) in diameter. Use an electric drill and hole saw. You can increase or decrease according to the diameter of the air gap kit you have bought. Make sure to check the air gap first before drilling the hole. Step 2: Make sure that the hole is close to the dishwasher and garbage disposal as all the connections needed for the air gap involves those two. This is also so you can save inches in tube length. Step 4: Remove the cover and the collar located on top of the air gap body. However, you have to leave the gasket, washer, and nut located on the bottom part of the body. 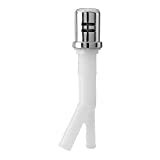 Insert this bottom air gap part into the hole found in the sink that you have propped open or created, coming from underneath the sink. Step 5: Attach the drain hose coming from the dishwasher to the smaller leg of the air gap body and secure it with a stainless steel hose clamp. Next, attach the drain hose from the garbage disposal to the bigger leg of the air gap body. Just like the other hose, secure it with a hose clamp. Step 6: Place the collar that you have removed before onto the nut and tighten them against the rim of the hole located on the sink (you may use a wrench for a tight secure fit). Put on the air gap cover/head, marking the finale of your installation. Rotate the beauty cover where the vent slots point toward the sink. Step 7: Set your dishwasher for a spin to check if everything works accordingly. Watch out for leaks from the hoses you have connected and ensure that everything is flowing to the way they are supposed to go. If you spot any water coming out from any part of the air gap, check all the fittings again. Rinse and repeat until there are no leaks. Key takeaway: The installation of an air gap onto your dishwasher to garbage disposal is not that difficult. The air gap doesn’t even cost that much and you can finish the installation only in a matter of minutes (provided that you don’t need to drill a hole). It saves you money from paying a plumber, which may charge you anywhere from $60 to $200. What are the things you will need for the installation of air gap? Flat-blade screwdriver – For propping open the covered hole in the sink. Power drill – For drilling a hole onto the sink (next to the faucet) in case there are pre-punched holes. Hole saw – To smoothen the edges of the hole you have drilled. Masking Tape (optional) – To tape the edges and nearby areas of the sink while you are doing the entire drilling process. Hose clamps – To secure the hoses once you have connected them onto the dishwasher and garbage disposal. Wrench – To tighten the nut against the body of the air gap. Why do you need to install an air gap in your dishwasher? An air gap brings more pros than cons and it’s actually a great addition to your dishwasher not only because the city ordinance requires it, but also because it brings additional safety and minimizes health hazards. For only some $20 dollars of air gap kit and a few minutes of your time and effort needed for installation, you’ll be doing yourself a huge favor.